Tailored to meet your needs whether beginner or seasoned sailor. Cruise the Solent, calling at Hamble, Cowes, Lymington or Yarmouth. Cross the Channel to Normandy, Brittany or the Channel Islands. Westcountry Cruises our speciality. Skippered or Bareboat. We run RYA Practical Courses all year round. To book your course or check availability email martin@southwestyachting.com or telephone 07831 644394. The Round the Island Race is set to be a great event with up to 2000 yachts competing to sail around the Isle of Wight. This is the largest racing fleet in the world, so why not join in what will be the spectacle of the year. Daily events tailored to suit your needs. A gentle sail around the Solent taking in lunch at one of the many marinas or for the more adventurous a spot of match racing. All our yachts are maintained to the highest standards and are all coded to the safety standards specified by either the Marine Coastal Agency (MCA). Southwest Yachting is proud of its fleet, which is amongst the finest in The Solent. 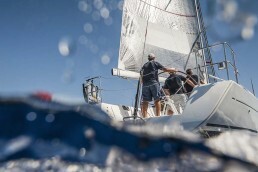 There’s nothing better than crewing a yacht to develop team spirit and improve group dynamics. Southwest Yachting offers packages for senior board directors to junior admin staff. We are able to offer team building days to suit your specific objectives. Start Yachting this spring for £199 and sign up for one of our "Start Yachting" weekends in 2019. £199 gets you on board our Bavaria 38 "White Oryx IV". Your weekend starts out of Lymington and includes two days sailing in the Solent and an overnight stay on the Isle of Wight. If you enjoy it, and learn the ropes, you will be awarded an RYA Start Yachting Certificate of competence. This offer also includes a further 15% discount on RYA Competent Crew and RYA Day Skipper courses taken in 2019! (Only available to new clients). For further information call Martin on 07831 644394. Sail VAT Free in 2019! Sail VAT Free in 2019 on all RYA Practical Courses and Skippered Charters. RYA practical courses include: Start Yachting, Competent Crew, Day Skipper and Coastal Skipper, we also offer a range of RYA shore based theory courses including Day Skipper, Coastal/Yachtmaster, VHF Radio Operator, First aid and Sea Survival.